First meeting between families since abduction; families thank supporters, IDF. "Naftali, Gilad, and Eyal: We love you and miss you." 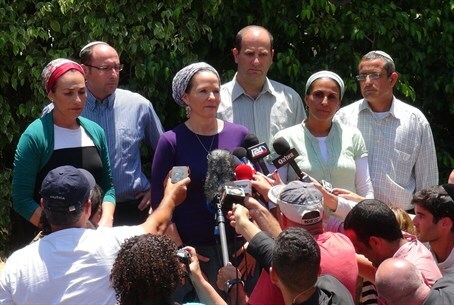 The parents of kidnapped teenagers Naftali Frenkel (16), Gilad Sha'ar (16), and Eyal Yifrah (19) made a joint statement to the press Tuesday, after the first meeting of the three families since the boys were abducted Thursday night by Hamas terrorists. ''We met today for the first time, the Yifrahs, Eyal's parents; the Sha'ars, Gilad's parents; and the Frenkels, Naftali's parents," the families said, in a joint statement. "The meeting was very significant and important for us, we have met good people here and we are confident in the strength of the Creator of the Universe [to bring the boys home]." ''We want to give our support for the security forces, who are working day and night to find the boys, the decision-makers, and the Prime Minister, who has been in constant contact with us," they continued. "We pray that our soldiers will be safe and bring home our boys unharmed, and we are grateful to all those involved in this tremendous effort." ''We feel a huge hug from the people of Israel, who accompanies us every hour - this strengthens us very much," they concluded. "Please keep praying and doing good deeds." "To Naftali, Gilad, and Eyal: We love you and miss you. Be strong." Earlier Tuesday, the families held a joint meeting at the Frenkel family home in Nof Ayalon for the first time since the abduction. The Frenkel's are joint US-Israeli citizens. Several MKs, religious officials, and members of the public have flocked to the families' homes since news broke of the kidnapping Friday to comfort the families - but in this meeting, the families sat alone for over an hour, observers at the scene said. "We will stay strong together," one of the families reportedly said to the press, just before the meeting began.